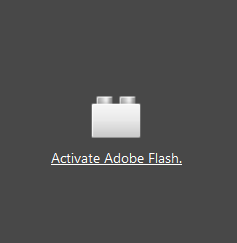 Make sure Flash is not enabled by default. Flash is very dangerous. The biggest problem comes from advertisements running automatically on your computer using flash. They consume bandwidth and sometimes run hidden adware or viruses. On many popular sites these aversive flash ads consume most of your download time. These ads are so aversive and flash so dangerous, that Amazon has banned flash ads. Youtube avoids using it as well. However, many sites that don't keep up with technology and aren't particularly security conscious, require flash to play their video content. 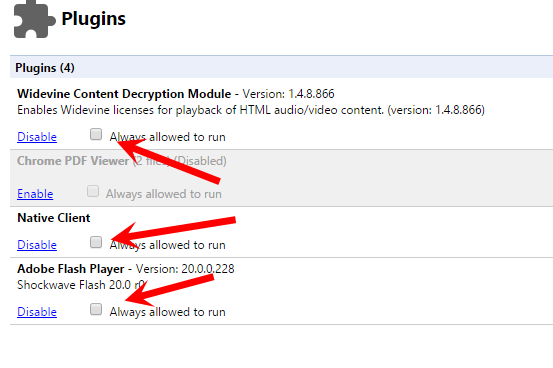 Firefox blocks flash entirely by default, but gives you control. Chrome opens but then pauses them and offers you a choice, to play or not to play for any content "peripheral to the main page." Set all of them to ask to activate (or get rid of them entirely). Of course, only Flash is flash, but none of these should be activated by default. The exception is that some government tax filing sites require flash to be always on because they are idiots and security challenged. Perhaps they are trying to make sure people are hackable. When you do this, you'll be asked to activate flash with a symbol like this where the video would play. Additionally, a second popup will appear asking whether you want it to always activate on this site, or ask every time. The Lego like icon in the address bar indicates a click to play activation is needed. If you are going to use the site a lot, you might select Allow and Remember so you don't need to repeat this process each time. 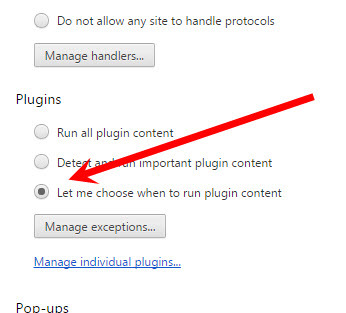 Under Plugins check Let me choose when to run plugin contents. Also check manage exceptions and make sure nothing is allowed to run automatically. Sadly, this setting can be overridden, so you also need to set it in a second place. Make sure the always allowed to run is never checked. What if I don't use Firefox or Chrome? Start using one or the other. Microsoft's IE is dangerous and being abandoned, while the new Edge browser is a couple years away from being usable.